A well-designed room visually flows from top to bottom. Ashley Stark-Kenner explains how expansive artwork, edgy shapes, and a classic David Hicks rug design work together to create the visual flow in this room. “The rug in this room is a classic 1970s David Hicks design that has been redone with modern grays and neutrals, utilizing the colorway Desert Night. 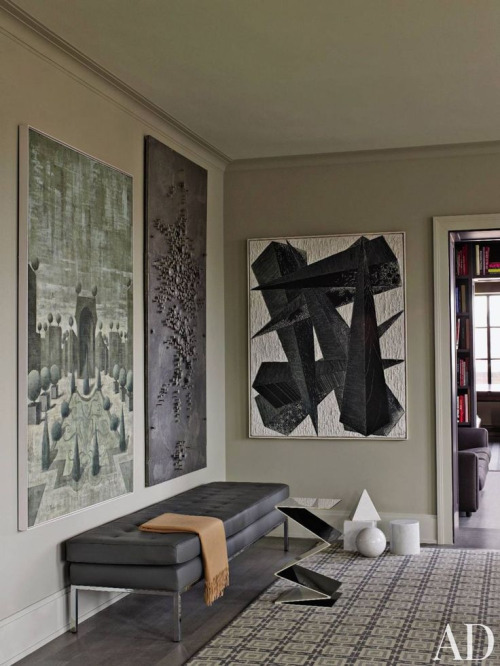 The pieces of oversized art are visually interesting without being overbearing, which creates just enough atmosphere. While the edgy shapes are decidedly modern, the throw blanket, leather couch, and rug work in tandem to bring a sense of coziness back to the room.